Maintaining the the original Audi quality, smoothness and reliability were the key factors in the VF design. VF have harnessed reliability of Eaton superchargers with their 15 years of supercharging experience and state of the art production techniques to create the ultimate water cooled supercharger system for the Audi S4. All key components are 100% made in California. This system has been fully road tested and dyno tuned on the Mustang MD500AWD. The Audi S4 supercharger kit is setup at 5.5 psi and creates as much, if not more power than similar products running greater levels of boost. Installation is very simple and is fully reversible. VF engineers spent several years developing, testing and refining the Audi S4 supercharger kit for consistency. Software flash technology and the latest Audi file versions have all been combined to provide the cleanest and most reliable method of end user software installation using the “Hex-Flash” programming cable. All test cars were put through long term full throttle testing in conditions varying from wet cold climates to hot dry Arizona desert temperature for safe-optimal air fuel ratios and knock activity monitoring. Competently-written ECU software has allowed VF to fully explore the potential of the Audi S4 engine. The Eaton TVS1900 supercharger is mounted with a CNC machined aluminum cast intake manifold with an integrated water cooling heat exchanger. VF’s approach to supercharger development is quite unique when it comes to design and production style. The unit is accurately positioned in line with the original serpentine belt which is replaced with a longer OEM belt. 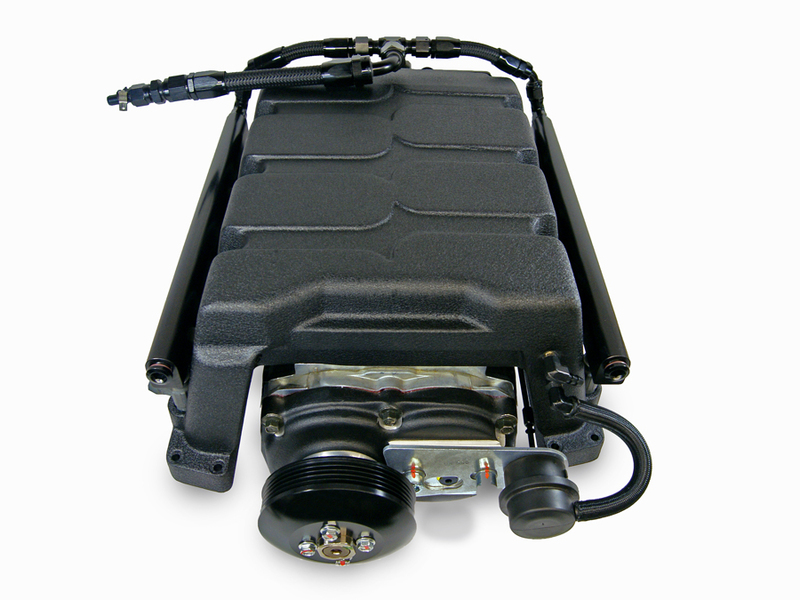 All supercharger systems are designed at VF-Engineering using state of the art technology. An example of this engineering is the employment of a Faro CMM to position and align the supercharger unit and offset for precise belt alignment. Exact belt alignment determine long term reliability of the drive belt, bearings and accessories. The supercharger unit is dowel pinned to the manifold and the manifold is dowel pinned to the cylinder heads to ensure optimal alignment consistency. The key to this design is the OEM active-spring belt tensioner introduced by VF which minimizes belt slip and gives continuous drive for the supercharger. The supercharger intake is created for maximum air flow and draws through the throttle body, making the supercharger “pump” integral to the engines function. The integrated boost overrun system is designed for smooth off-throttle cruising and deceleration. The crankcase ventilation system is designed to cope with positive pressure. Higher capacity OEM fuel injectors are supplied fully assembled with new high capacity fuel rails and cross over fuel line which connects to the OEM fuel feed. The VF supercharger system remains fully OBD2 compliant and is supported by a 1 year unlimited mileage warranty on the product only.